R W Palmer Electrical Service as members of the National Electrical & Communications Association (NECA) and BICSI, complies with the standards recommended by industry and meeting the minimum Australian standards. Compliance and commitment to our staff, client and the public are supported by our policy and procedures integrated into our management plan. 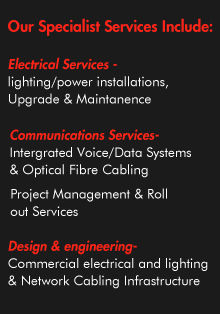 R W Palmer Electrical Service meets the requirements of the NSW Occupational Health and Safety (OHS) act.